Yesterday I took a wonderful, lazy walk into the woods behind our house. It was simply soothing to my soul and warm to my body. The sun peeked out from behind a cloud teasing me as I meandered past the corn fields and along a creek bed. The cool breeze sang in a hush to the wild flowers and tall grasses as they swayed to its music. It was mesmerizing to witness nature and the earth dance together. It is in these moments that I feel authentic and valid and part of something bigger. As I walked into the woods and through the fallen limbs, I heard the wind as it brushed the tree tops of the tall sycamores. 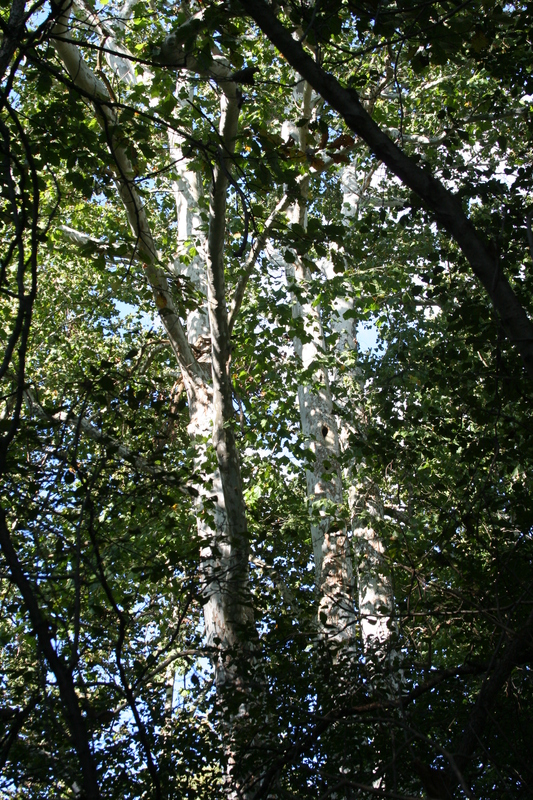 Magnificent sycamore trees. Their tripled trunk like three friends willing to support each other throughout life. Their branches ever reaching towards the sky with confidence. Looking up through the leaves as they were waving hello, I saw the sun shining through. Wonderful, warm sun. She lit up the tips of the trees- so far above my head. Thank goodness I had my camera. I so wanted to remember that moment looking up as I leaned against the trunks of those majestic trees. I sat for sometime back out in the sun and watched the world go by. Butterflies and bees, cat tails and wild flowers all knowing winter would not be far away. But not yet…yesterday was a gorgeous afternoon. It was a fine fall day.